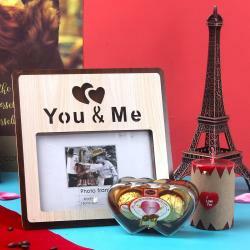 Product Consists : Cage Shape Photo Frame (Photo Size:10Cm X 8Cm) with Love Couple Shape Home Made Chocolate Bar. 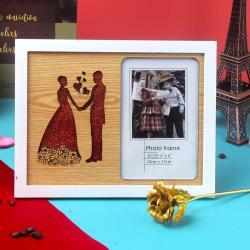 Photo frame gifting perfectly adds a special emotional love ingredient feelings. 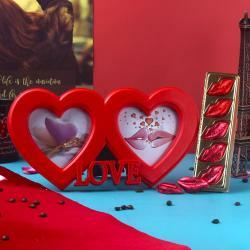 It is a pure Valentine surprise of Cage Shape Photo Frame with Love Couple Shape Chocolate for your Darling. Sometimes you will never know the value of a moment until It becomes a memory. This unforgettable Items to perfect delight your recepient. Express your feelings with theme gift and make receiver happy with warm hug feeling on special day. So book your order now and brighten up the face with a perfect smile. This can be used as a decorative piece like for your living room, hall or bedroom it gives attractive look of your place. Apart from decorative purpose, it is also known for a brilliant choice gift that can be presented to your near ones on their auspicious occasions. It is a versatile casual gift which can be gifted in any season at any time. Photos Frame which are liked by all age group people. Sweet way to make your partner smile at silly tiny gifts and delighted feelings and to see the glow of eyes for each surprises.....just love and be loved. It is the Perfect Gift. So, express your feelings for someone you love on special days like Valentine's Day, Birthday, Anniversary and Many more. Giftacrossindia.com brings to you this awesome items, which is all set to make your special someone feel more special. Browse your favorite products, it is very conveniently available for online shopping from anywhere in India with Free Shipping. 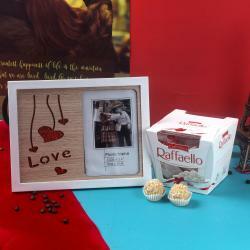 Product Includes : Cage Shape Photo Frame (Photo Size:10Cm X 8Cm) with Love Couple Shape Home Made Chocolate Bar.